Cholinergic transmission has been implicated in learning, memory and cognition. However, the cellular effects induced by muscarinic acetylcholine receptors (mAChRs) activation are poorly understood in the neocortex. We investigated the effects of the cholinergic agonist carbachol (CCh) and various agonists and antagonists on neuronal activity in rat neocortical slices using intracellular (sharp microelectrode) and field potential recordings. CCh increased neuronal firing but reduced synaptic transmission. The increase of neuronal firing was antagonized by pirenzepine (M1/M4 mAChRs antagonist) but not by AF-DX 116 (M2/M4 mAChRs antagonist). Pirenzepine reversed the depressant effect of CCh on excitatory postsynaptic potential (EPSP) but had marginal effects when applied before CCh. AF-DX 116 antagonized the depression of EPSP when applied before or during CCh. CCh also decreased the paired-pulse inhibition of field potentials and the inhibitory conductances mediated by GABAA and GABAB receptors. The depression of paired-pulse inhibition was antagonized or prevented by AF-DX 116 or atropine but only marginally by pirenzepine. The inhibitory conductances were unaltered by xanomeline (M1/M4 mAChRs agonist), yet the CCh-induced depression was antagonized by AF-DX 116. Linopirdine, a selective M-current blocker, mimicked the effect of CCh on neuronal firing. However, linopirdine had no effect on the amplitude of EPSP or on the paired-pulse inhibition, indicating that M-current is involved in the increase of neuronal excitability but neither in the depression of EPSP nor paired-pulse inhibition. These data indicate that the three effects are mediated by different mAChRs, the increase in firing being mediated by M1 mAChR, decrease of inhibition by M2 mAChR and depression of excitatory transmission by M4 mAChR. 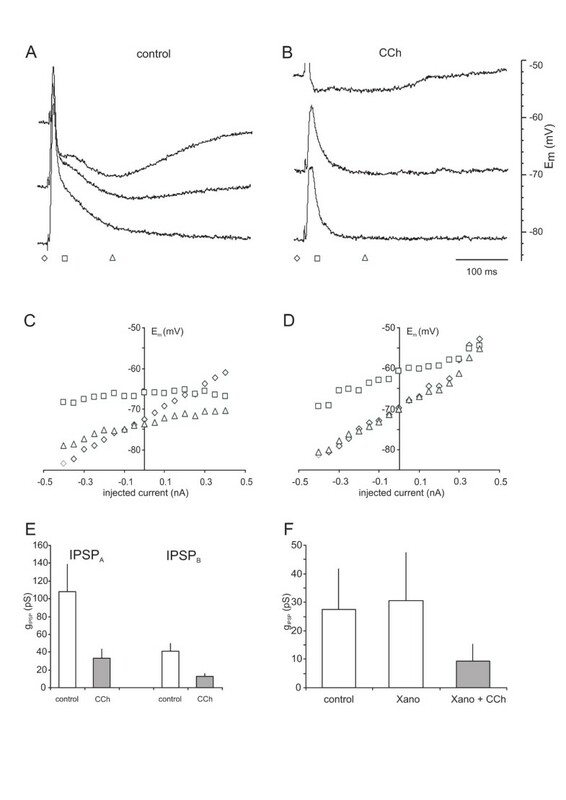 The depression of EPSP and increase of neuronal firing might enhance the signal-to-noise ratio, whereas the concomitant depression of inhibition would facilitate long-term potentiation. Thus, this triade of effects may represent a “neuronal correlate” of attention and learning. Considerable evidence indicates a crucial role of acetylcholine (ACh)-mediated transmission in learning and memory. Impairment of cholinergic signalling contributes to cognitive deficits in animal models  and diseases such as schizophrenia and Alzheimer’s Disease [2–4]. Conversely, drugs that augment cholinergic transmission (e.g. donepezil or galatamine) have been shown to improve certain cognitive functions [5, 6]. In this context metabotropic ACh receptors, termed muscarinic ACh receptors (mAChRs)  play a crucial role. Five mAChR subtypes have been cloned (M1-M5); each consisting of seven highly conserved transmembranal segments. A large and more variable intracellular domain  couples the receptor to second messengers and ion channels via heterotrimeric G-proteins [1, 7, 9, 10]. The mAChRs are now recognized as key targets for the treatment of different neuropathologies such as Alzheimer’s Disease, schizophrenia and Parkinson’s Disease . In particular, agonists of M1 mAChR or antagonists at M2 or M4 mAChRs are promising substances [10, 11]. However, the similarity in ligand-binding sites between mAChR subtypes, the paucity of selective agonists/antagonists as well as the expression of different subtypes of mAChRs in a given area constitute major obstacles to delineate cellular effects of a given subtype . The improvement of therapeutic approaches using specific mAChR modulators is further impeded by a lack of established and validated protocol to screen efficacy of different mAChR agonist/antagonist at native receptors in neocortical slices. Characterization of receptors in a native system is a crucial issue. For instance, at D2-type dopamine receptors  or AMPA receptors , the pharmacology at recombinant receptors critically depends on the experimental conditions. Thus, the pharmacology of mAChR in heterologous systems may not necessarily relate to the natively expressed mAChR . Therefore, to delineate the pharmacology of mAChRs in the neocortex, the data must be obtained in the native neocortical slice. We tried to define simple paradigms to quantify routinely the efficacy of different mAChR agonists. This should facilitate further screening for novel drugs in the neocortex. We investigated the effects of CCh and various mAChR antagonists on several parameters of neuronal excitability and the synaptic transmission in neocortical layer II/III. We have chosen layer II/III of neocortex because of the established expression of M1, M2 and M4 but not M3 and M5 mAChRs at the mRNA  and the protein levels [15–18]. As a first step we tested whether the published effects obtained under various experimental conditions can be reproduced. Firstly, in neocortical pyramidal neurones, ACh or the prototype cholinergic agonist carbamylcholine-chloride (carbachol, CCh) depolarizes the membrane potential and increases action potential (AP) firing [19–21]. Secondly, CCh reduces excitatory postsynaptic potentials (EPSPs) in neocortical neurons [21, 22]. This depressant effect was reduced by the preferential M1/M4 and M2/M4 mAChRs antagonists (pirenzepine and AFDX 116, respectively) and was not due to activation of nicotinic receptors . Thirdly, ACh reduces the GABA release in neocortex via activation of M2 mAChR and to a smaller extent by activation of M1 mAChR . Here we show that these 3 effects are mediated by 3 different subtypes of mAChRs allowing screening for mAChRs subtype-specific agonists/antagonists. 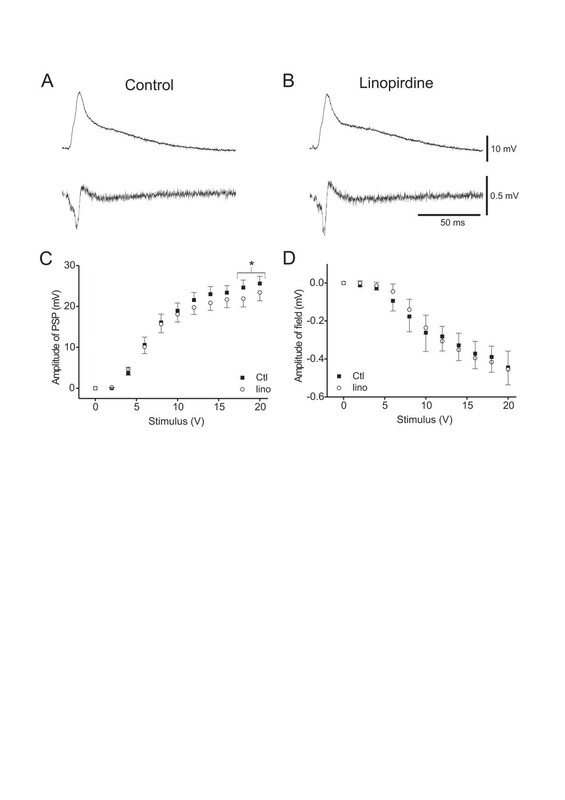 In control conditions, neurones had a resting membrane potential (Em) of −76.2 ± 0.4 mV, an input resistance of 20.4 ± 0.8 MΩ and the AP amplitudes averaged 92.4 ± 0.7 mV (n = 92). The slope of neuronal AP firing was 57.3 ± 1.6 APs/nA in control conditions. Bath application of CCh had no effect on Em (control: -75.5 ± 0.7 mV, CCh: -74.8 ± 0.7 mV; n = 40, p > 0.05) or AP amplitudes (control: 89.5 ± 1.2 mV, CCh: 88.5 ± 1.3 mV; n = 40, p > 0.05). However, CCh consistently increased the neuronal input resistance (control: 20.4 ± 1.3 MΩ, CCh: 24.2 ± 1.4 MΩ; n = 40, p < 0.002). During CCh application a given current injection elicited more APs (Figure 1A, B, C). The slope of neuronal firing averaged 58.4 ± 2.1 APs/nA in control and increased to 97.8 ± 3.4 APs/nA in the presence of CCh (n = 40, p < 0.0001), much more than anticipated from the increase in membrane resistance. The reversibility of CCh effect on slope of neuronal APs firing was by 66.4 ± 6.0% after washout (n = 10; Figure 2A). The sub-rheobase for AP generation was significantly decreased during perfusion with CCh (control: 0.5 ± 0.02 nA, CCh: 0.46 ± 0.02 nA, n = 40, p < 0.01). Atropine (n = 7) or pirenzepine (n = 7) reversed the CCh-induced increase of slope of neuronal firing (p < 0.05 vs CCh alone and p > 0.05 vs. control; not shown). This antagonism was almost complete and indistinguishable from the reversibility observed after washout (n = 10; p > 0.05; Figure 2A). However, AFDX did not reverse the CCh-induced increase of slope of neuronal firing (p > 0.05 vs. CCh and p < 0.05 vs. control). In fact, the antagonism observed with AFDX (n = 7) was much smaller than the reversibility observed after washout (n = 10, p < 0.01; Figure 2A). In the continuous presence of CCh, the antagonism observed during a co-application of “pirenzepine + AFDX” (n = 8) was not different to that obtained during application of pirenzepine alone (n = 7, p > 0.05; Figure 2A). This suggests that the slight antagonism observed during application of AFDX alone is due to some antagonistic effect of AFDX on M1 mAChR. The slope of neuronal firing during application of CCh in atropine-containing (n = 9) or pirenzepine-containing artificial cerebrospinal fluid (ACSF) (n = 7) is significantly smaller than that obtained during application of CCh in standard ACSF (n = 40, p < 0.01; Figure 2B). 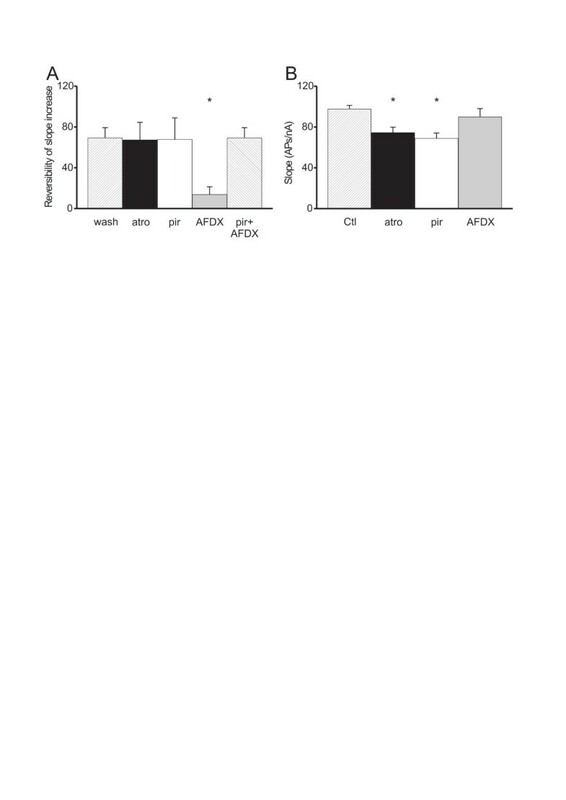 However, the slope of neuronal firing during application of CCh added to an AFDX-containing ACSF (n = 7) is not different to that obtained during application of CCh in standard ACSF (n = 40, p > 0.05; Figure 2B), i.e. AFDX fails to modify the CCh-induced effects on firing. To further test the involvement of M1 mAChR in the effects on firing, we applied xanomeline, a M1/M4 preferring mAChRs agonist . Xanomeline increased the slope of neuronal firing from 57.8 ± 6.5 APs/nA to 80.4 ± 7.7 APs/nA (n = 11, p < 0.001). Together these data suggest that CCh exerts its action on slope of neuronal firing via mAChRs, and in particular M1 but not M2 or M4 mAChRs. To test the involvement of KV7 channels blockade  in the M1 mAChR-mediated increase of neuronal firing, we applied linopirdine (10 μM), a blocker of KV7 channels . Bath application of linopirdine had no effect on AP amplitudes (control: 97.5 ± 1.6 mV, linopirdine: 95.4 ± 2.5 mV; n = 12, p > 0.05) or on Em (control: -76.5 ± 1.1 mV, linopirdine: -75.6 ± 1.2 mV; n = 12, p > 0.05) as expected since KV7 channels are not activated at −75 mV . However, linopirdine increased the neuronal input resistance (control: 17.8 ± 1.8 MΩ, linopirdine: 28.4 ± 3.2 MΩ; n = 12; p < 0.0001). Linopirdine increased significantly the number of APs at each current magnitude (Figure 1D). Consequently, the slope was 58.4 ± 5.1 APs/nA in control and increased to 79.8 ± 7.8 APs/nA in the presence of linopirdine (n = 12, p < 0.002). The sub-rheobase for AP generation was strongly decreased from 0.58 ± 0.05 nA in control to 0.36 ± 0.03 nA in the presence of linopirdine (n = 12, p < 0.0001). Bath application of retigabine (10 μM), an activator of KV7 channels , had no effect on AP amplitudes (control: 95.6 ± 1.6 mV, retigabine: 95.1 ± 2.8 mV; n = 7, p > 0.05), on Em (control: -81.5 ± 1.6 mV, retigabine: -81.9 ± 1.6 mV; n = 7, p > 0.05), or on neuronal input resistance (control: 15.3 ± 3.3 MΩ, retigabine: 13.3 ± 1.8 MΩ; n = 7; p > 0.05). Retigabine decreased significantly the number of APs at each current magnitude (not shown). Consequently, the slope was 53.9 ± 6.1 APs/nA in control and decreased to 12.2 ± 1.9 APs/nA in the presence of retigabine (n = 7, p < 0.0002). The sub-rheobase for AP generation was increased from 0.81 ± 0.09 nA in control to 0.99 ± 0.12 nA in the presence of retigabine (n = 7, p < 0.01). Paired-pulse protocols are often used to study GABAergic inhibition in field potentials . We therefore employed a paired-pulse protocol as a first step towards studying CCh modulation of inhibition. The input–output curves obtained in ITRC (n = 49; not shown) were qualitatively similar to that obtained in STRC, except for larger amplitudes of potentials (p < 0.0001), as expected . The amplitude of the field potentials decreased significantly in the presence of CCh (10 μM) at stimulus intensities larger than 0.3 mA (not shown; n = 49, p < 0.05). This CCh-induced synaptic depression was antagonized by atropine (n = 19). Pirenzepine (n = 15) and AFDX (n = 16) at least partially reversed the CCh-induced depression. Linopirdine (n = 10, p > 0.05) and retigabine (n = 8, p > 0.05) had no effect on synaptic transmission (data not shown). Paired-pulse stimulations (interpulse intervals: 10 ms - 1 s) were used to determine the magnitude of paired-pulse depression of the second field potentials (FP2). Since the apparent time-to-peak of the intracellular GABAA-mediated response is about 20–30 ms , we focus here on the results obtained for interpulse intervals of 10–30 ms to investigate GABAA receptor-mediated inhibition. A high stimulus intensity (1 mA) was used to maximally activate GABAergic transmission. When two pulses were delivered 20 ms apart, the mean amplitude of the FP2 was 25 ± 4% of the amplitude of the first (FP1; n = 59). CCh (10 μM) decreased slightly the amplitude of FP1 (to 92 ± 15% of control value; n = 49, p < 0.05; Figure 3A, B), whereas the amplitude of FP2 increased strongly (to 342 ± 50% of the control value; n = 49, p < 0.0001) for an interpulse interval of 20 ms (Figure 3A, B). 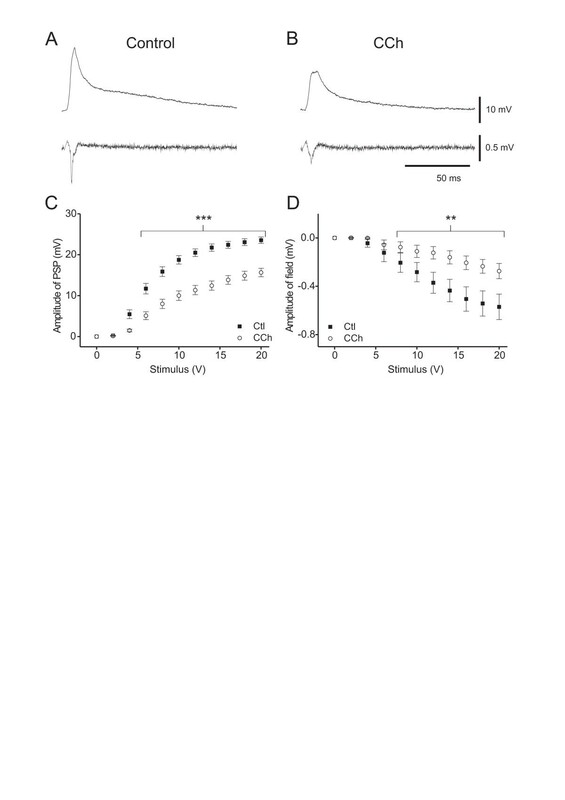 This resulted in an increase of the paired-pulse ratio (PPR) which was significant for interstimulus intervals from 10 ms to 400 ms (control: 0.24 ± 0.04, CCh: 0.69 ± 0.06, interstimulus interval 20 ms; n = 49, p < 0.0001; Figure 3D). 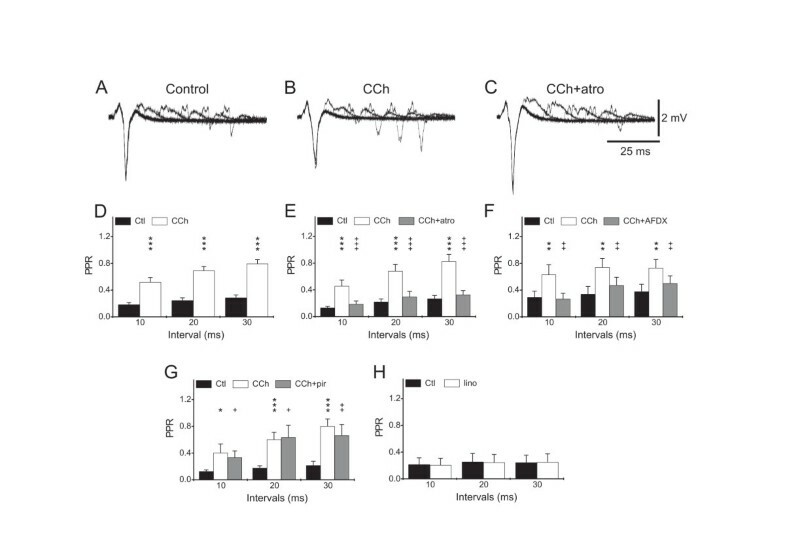 At interpulse intervals between 10 and 30 ms, both atropine (n = 19, p < 0.05 vs. CCh and p > 0.05 vs. control; Figure 3A, B, C, E) and AFDX (n = 15, p < 0.05 vs. CCh and p > 0.05 vs. control; Figure 3F) antagonized the CCh-induced increase in PPR. In contrast, the CCh-induced increase of the PPR at these interstimulus intervals was unaltered by addition of pirenzepine (n = 14, p > 0.05 vs. CCh and p < 0.05 vs. control; Figure 3G). Conversely, application of AFDX (n = 6) or atropine (n = 5) prevented the CCh-induced increase of PPR (p > 0.05 vs. control; not shown), whereas pirenzepine failed to prevent this CCh-induced increase of PPR (n = 7, p < 0.05 vs. control; not shown). Application of linopirdine had no effect on the PPR (n = 10, p > 0.68; Figure 3H) suggesting that the M-current blockade is not involved in the CCh-induced increase of PPR. Additionally, we verified that retigabine (10 μM) did not alter the PPR (not shown, n = 8, p > 0.05). This suggests that modulation of GABA release, underlying the paired-pulse depression, is dominated by M2 mAChR effects. To further rule out the involvement of M1/M4 mAChRs in the depression of inhibition, we applied xanomeline. Xanomeline did not alter the PPR (n = 6, p > 0.05). To more directly evaluate the effects of mAChRs on synaptic inhibition, we evaluated the synaptic conductances underlying the IPSPA and IPSPB in the presence of various mAChR related compounds. Application of CCh greatly reduced the amplitudes of both, IPSPA and IPSPB components (Figure 4 A,B). Estimating the underlying conductances (gIPSP) revealed substantial decreases; gIPSP-A decreased from 110 ± 31 nS to 34 ± 11 nS, gIPSP-B decreased from 41 ± 9 nS to 12 ± 3 nS, i.e. by 69.1 and 69.8%, respectively (Figure 4E; n = 17, p < 0.05). To evaluate which subtypes of mAChRs are involved in this modulation of inhibition we first tested the M2/M4 mAChRs antagonist AFDX in the presence of CCh. In these neurones, CCh virtually abolished the conductances of both IPSPs (gIPSP-A from 32.8 ± 13.6 to 0.0 ± 5.4 nS; n = 5, p < 0.05 and gIPSP-B from 18.7 ± 4.6 nS to 3.5 ± 1.4 nS; n = 5, p < 0.05). Application of AFDX caused a considerable reversal in the depression of inhibition recovering to 63 and 72% of the control values (p > 0.05 vs. control). Next we tested the effects of the M1/M4 mAChRs antagonist pirenzepine. Application of CCh considerably reduced the synaptic conductances, gIPSP-A from 104.3 ± 39.4 nS to 58.9 ± 29.0 nS, gIPSP-B from 25.0 ± 8.2 nS to 13.0 ± 5.3 nS i.e. on average by 44 and 48%. On addition of pirenzepine, the depression of inhibitory conductances was essentially unaltered (gIPSP-A: 74.9 nS, p > 0.05 vs. CCh; gIPSP-B: 15.7 nS p > 0.05 vs. CCh). To further substantiate our hypothesis of a M2 mAChR-mediated depression of inhibition, we next tested xanomeline to evaluate possible effects of M1 or M4 mAChRs. Application of xanomeline (3 μM) had no consistent effect on Em or Rm (control −75.2 ± 2.0 mV, 26.7 ± 9.0 MΩ xanomeline: -76.4 ± 1.7 mV, 26.1 ± 9.7 MΩ p > 0.05). These neurones exhibited the usual alteration of slope of firing (increasing from 64.4 ± 10.7 to 79.4 ± 10.9 APs/nA) and the depression of EPSP amplitudes (from 25.0 ± 1.7 to 23.8 ± 1.2). Yet, the gIPSP-A and gIPSP-B were unaltered (control: 88 ± 29 nS, 28 ± 7 nS, xanomeline: 92 ± 28 nS, 31 ± 8 nS, respectively, n = 5, p > 0.05, see Figure 4 F). Addition of 10 μM CCh in the presence of xanomeline had no further effect on Em or Rm (p > 0.05 vs. CCh) but greatly reduced both inhibitory conductances, gIPSP-A decreased to 36 ± 18 nS and gIPSP-B to 9 ± 3 nS, i.e. by 61.2 and 69.1%, close to the values obtained for CCh alone. The difference to control was significant for gIPSP-B (p < 0.05), but just not significant for the gIPSP-A (p = 0.057). In control ACSF, the amplitudes of EPSP and field potentials increased progressively with increasing stimulus intensities to reach a plateau (Figure 5C, D). Application of CCh (10 μM) decreased the amplitude of both EPSP (n = 45, p < 0.001; Figure 5A, B, C) and field potentials (STRC; n = 42, p < 0.05; Figure 5A, B, D) in a similar range of stimulus intensities. The input–output curves of EPSP were well fitted by the Boltzmann equation yielding a maximal EPSP amplitude (EPSPmax) of 22.6 ± 0.9 mV, a half maximal stimulus intensity (I50) of 6.71 ± 0.36 V and a slope factor of 1.66 ± 0.14 (n = 45). CCh significantly decreased EPSPmax to 16.0 ± 1.1 mV and increased both I50 and slope factor to 9.08 ± 0.44 V and 2.82 ± 0.24, respectively (n = 45; p < 0.001), i.e. the curve became more shallow and I50 shifted to higher values. The depression of field potentials by CCh (n = 8) was completely reversible (p > 0.05 vs. control), whereas that of EPSPs (n = 11) was partially reversible after washout. The EPSPmax recovered on average by 66 ± 11% after washout (p < 0.05 vs. control and CCh), whereas the effects on I50 and slope factor were completely reversible (p > 0.05 vs. control, n = 11). Atropine (1 μM) alone had no effect on the amplitude of EPSP or field potentials at all stimulus intensities (2–20 V; n = 9, p > 0.05; not shown). Also, I50 or slope factor were unaffected by atropine (not shown), indicating no obvious steady state modulation of synaptic responses by endogeneous mAChRs. Pre-application of atropine prevented the CCh-induced decrease of EPSPmax as well as the CCh-induced increase of I50 and slope factor (n = 7, p > 0.05 vs. atropine or vs. control; Table 1). Conversely, addition of atropine fully reversed the CCh-induced decrease of EPSPmax and field potential amplitude (n = 7, p > 0.05 vs. control and p < 0.05 vs. CCh; Table 1). The CCh-induced increase of I50 and slope factor were also reversed (n = 7, p > 0.05 vs. control and p < 0.05 vs. CCh; Table 1). This suggests that the CCh effects on excitatory synaptic transmission are mediated by activation of mAChRs. Applied alone, neither pirenzepine (1 μM; n = 10) nor AFDX (2 μM; n = 11) had detectable effects on the EPSP amplitude, I50 or slope factor of the input–output curve (not shown; p > 0.05). Application of pirenzepine in the presence of CCh antagonized the CCh-induced decrease of EPSPmax (n = 9, p > 0.05 vs. control and p < 0.05 vs. CCh; Table 2). Pirenzepine also antagonized the increase of slope factor (n = 9, p > 0.05 vs. control and p < 0.05 vs. CCh) and reduced the increase of I50 (CCh: 189 ± 39% of control; CCh + Pir:124 ± 12% of control; n = 9, p < 0.05 vs. control and CCh; Table 2). Application of pirenzepine prior to CCh, however, failed to prevent the CCh-induced decrease of EPSPmax (n = 7, p < 0.05 vs. control or vs. pirenzepine alone; Table 2). In fact, CCh added to a pirenzepine-containing ACSF depressed the EPSPmax to 76 ± 6% of control (n = 7), indistinguishable from the depression observed with CCh alone (to 69 ± 4% of the control; n = 45; p > 0.05). This failure of pirenzepine to prevent a CCh-induced depression, when applied before CCh, is in sharp contrast to the pirenzepine effect on neuronal firing, where pirenzepine is effective irrespective of the sequence of application. Application of AFDX in the presence of CCh partly antagonized the CCh-induced decrease of the EPSPmax (by 52.3 ± 3.1%; n = 8, p < 0.05 vs. control and CCh; Table 3). AFDX did not antagonize the effect on I50 or slope factor (n = 8, p > 0.05 vs. CCh and p < 0.05 vs. control; Table 3). Also, application of AFDX before addition of CCh prevented the depressant effect of CCh on EPSPmax. Indeed, the EPSPmax in the presence of AFDX + CCh was not different from that measured in the control condition (n = 7, p > 0.05; Table 3). Pre-application of AFDX also prevented the CCh-induced increase of I50 (p > 0.05 vs. control or AFDX alone) but not the increase of slope factor (n = 7, p < 0.05 vs. control or AFDX alone). To further determine which subtype of mAChR mediates the effects of CCh on EPSP, we applied xanomeline. Xanomeline decreased the EPSPmax from 25.6 ± 1.8 mV to 23.2 ± 2.7 mV (n = 12, p < 0.05). Linopirdine had no effect on the amplitude of the field potentials (Figure 6A, B, bottom traces, 6D and only marginally decreased (< 10%) the amplitude of EPSP (Figure 6A, B, top traces). This effect was only present at higher stimulus intensities (n = 12, p < 0.05; Figure 6C). Linopirdine had no effect on the slope factor but slightly reduced I50 (from 6.9 ± 0.6 V to 6.4 ± 0.6 V; n = 12, p < 0.05). Retigabine (10 μM) had no effect on the maximal amplitude of the field potentials (control: -0.54 ± 0.13 V, retigabine: -0.53 ± 0.13 V), on EPSPmax (control: 30.8 ± 3.4 V, retigabine: 30.5 ± 4.0 V), or the slope factor (control: 1.01 ± 0.26 V, retigabine: 1.12 ± 0.24 V) (n = 8, p > 0.05 for all). However, retigabine increased I50 (from 11.3 ± 0.8 V to 13.2 ± 0.9 V; n = 8, p < 0.05). These data suggest that CCh–induced depression of maximal field potentials and EPSPmax are mediated by mAChRs not coupled to KV7 channels. The key findings of this study are: (i) activation of M1 mAChR increased the neuronal AP firing via blockade of M-current, (ii) activation of M2 mAChR increased the paired-pulse ratio of field potentials and decreased both components of GABAergic inhibition, and (iii) activation of M4 mAChR depressed glutamatergic transmission presumably via activation of presynaptic receptors. The previous studies investigating the mAChRs in slice preparations used either sharp microelectrode recordings [20, 30] or whole cell patch clamp recordings [22, 23, 31, 32]. The latter disturb the intracellular milieu and a massive rundown of M-current (modulated by mAChRs) was observed , precluding a reliable pharmacology. Intracellular recordings in cortical slices with sharp microelectrodes hence present a valuable method to quantify the effects at native mAChRs in slices. However, reports in the neocortex focussed on the role of mAChRs or M-current either on the neuronal firing [20, 30, 32], on the GABAergic transmission [23, 31] or on the glutamatergic transmission [22, 34]. Only few studies in cortex e.g. or in hippocampus e.g. investigated the role of mAChRs on both neuronal firing and synaptic transmission. The comparison of data obtained in different preparations using different experimental conditions is problematic, though. Therefore, in the present study we investigated the 3 aspects, namely change of firing, depression of EPSPs and of IPSPs, in the same preparation under identical experimental conditions. Although some authors used different concentrations of mAChRs agonists/antagonists, only one or few stimulus intensities e.g. or current injections e.g. were used. Therefore, the results were mostly qualitative from a physiological point of view, precluding quantitative comparisons of different agonists/antagonists. The consistent increase in the slope of neuronal firing by CCh in the somatosensory cortex is similar to the hippocampus  and the nucleus gracilis . However, our determination of slope and intercept provides a more quantitative analysis of changes of firing compared to previous observations [35, 36]. In particular, these authors compared the neuronal firing in response to a single current intensity before and during substance application. The interpretation of such data would be complicated by concomitant alterations of membrane potential and/or neuronal input resistance. In any case, alterations of firing are mediated by mAChRs, as evidenced by the antagonism by atropine. Moreover, the antagonism by pirenzepine (M1/M4 mAChRs antagonist) but not by AFDX (M2/M4 mAChRs antagonist) further suggests an effect via M1 mAChR, similar to the M1 mAChR-mediated repetitive spontaneous neuronal firing observed in rat prefrontal cortex . Our conclusion is in line with previous data indicating that ACh application increases the neuronal firing of neocortical pyramidal neurones in mice lacking M3 or M5 mAChRs but not in mice lacking M1 mAChR, confirming further an involvement of the M1 mAChR in this effect . The cellular mechanisms underlying the CCh-induced increase of AP firing can be inferred from the effect of linopirdine which is an established blocker of KV7 channels . Linopirdine increased the neuronal firing as in hippocampus  and entorhinal cortex . Together, these data indicate a M1 mAChR mediated depression of M-current  as the underlying mechanism of CCh-induced firing increase. We studied the mAChR mediated effect on neurotransmitter release by using the paired-pulse protocol with field potentials. CCh increased the PPR for interpulse intervals ranging from 10 to 400 ms. This suggests that the CCh effect involves both GABAA and GABAB receptor-mediated effects. The CCh-induced increase of the PPR is most likely due to mAChR-mediated depression of GABA release , and evoked IPSCs , during the first stimulus. Normally, GABA would attenuate the response to a second stimulus by decreasing release via presynaptic GABAB receptors [39, 40]. Hence a mAChR-mediated depression of GABA release might contribute to the altered paired pulse properties of synaptic responses. The involvement of M2 mAChR in the CCh-induced depression of GABA release underlying increase of PPR can be inferred from the antagonism by AFDX (M2/M4 mAChRs antagonist) and lack of antagonism by pirenzepine (M1/M4 mAChRs antagonist). Similar to the pharmacology at M1 mAChR, the effects of atropine and AFDX on this M2 mAChR-mediated increase of PPR were identical whether the antagonist was applied in the presence of, or before, CCh. Further evidence was obtained by evaluating the alterations in inhibitory conductance mediated by GABAA and GABAB receptors. Firstly, the similarity in the depression of both gIPSP-A and gIPSP-B, indicates a common denominator for both effects i.e. depression of GABA release. The effects of the selected compounds revealed which mAChR is involved in this depression of GABA release. The CCh effects were considerably antagonized by the M2/M4 mAChRs antagonist AFDX but slightly by the M1/M4 mAChRs antagonist pirenzepine. Moreover, the M1/M4 mAChRs agonist xanomeline had no effects on gIPSP-A or gIPSP-B, yet subsequent addition of CCh reduced gIPSP-A and gIPSP. This observation strongly suggests that neither M1 nor M4 mAChRs are involved in the modulation of GABA release. Together these data support our view that M2 mAChR are involved in the modulation of GABA release. This view is also supported by histological data. M2 mAChRs are predominantly localized at presynaptic axons of GABAergic neurones and are associated with asymmetric as well as symmetric cortical synapses [16–18, 23], suggesting that M2 mAChR can modulate GABA release in the neocortex. In addition, M1 mAChRs are mainly expressed on cortical pyramidal neurones rather than by GABAergic neurones . ACh reduces the GABA release in neocortex by two separate mechanisms i) by decreasing Ca2+ currents via activation of a M2 mAChR/PI3K/Ca2+-independent PKC pathway and to a smaller extent by activation of a M1 mAChR/PLC/Ca2+-dependent PKC pathway . This combination might explain the relatively large contribution of the M2 mAChR and the absence of detectable effects of the M1 mAChR in the CCh-induced increase of PPR observed here. Our observation of CCh decreasing the amplitudes of evoked synaptic potentials is in line with a wealth of evidence from various areas of the rodent brain [22, 34–36]. Both field potentials and intracellularly recorded EPSPs were depressed by CCh to a similar degree. Considering the marginal changes in Em, this decrease cannot be accounted for by a membrane depolarization, confirming results obtained in entorhinal cortex . These authors reported that the depression of synaptic transmission persisted when neurones were returned to their initial resting potential. However, previous observations in hippocampus e.g. or neocortex e.g. [21, 22] compared the synaptic response following a single stimulus intensity before and during substance application. Our determination of I50, EPSPmax and slope factor provide a more quantitative analysis of changes of synaptic transmission, corroborating and extending previous findings. In particular, the consistent effects over a wide range of stimulus intensities exclude the possibility of threshold phenomena. Our data indicate that this CCh-induced depression of EPSP is 1) fully prevented when CCh is applied in the presence of atropine or AFDX and 2) only partially prevented when CCh was applied in the presence of pirenzepine. This corroborates and extends previous data from layer V of the somatosensory cortex . Unlike these authors, applying CCh in the presence of antagonists, we also applied the mAChRs antagonists in the presence of CCh, revealing marked differences with different sequence of application. The CCh-mediated depression of EPSP was fully reversed when pirenzepine or atropine was added in the presence of CCh, i.e. pirenzepine is more effective when applied in the presence of the agonist. AFDX, however, only partially reversed this depression, i.e. is less effective when applied in the presence of the agonist. This peculiarity may contribute to the discrepancies between previous reports. Usually, the authors have either applied the antagonist in the presence of agonist or vice versa, the agonist in the presence of antagonists. To the best of our knowledge, the two complementary protocols had not been used in the same study so far e.g. either addition or pre-application was used, see [22, 42]. 1) The increase of neuronal firing by CCh was prevented and reversed by pirenzepine. However, the decrease of EPSPmax by CCh was reversed but not prevented by pirenzepine. This difference may suggest that the pirenzepine-sensitive effects on EPSPmax and on slope of neuronal firing are mediated by two distinct mAChRs, i.e. the pirenzepine-sensitive effect on EPSPmax is not mediated by M1 mAChR. 2) Only M2 and M4 mAChRs (but not M1, M3 and M5 mAChRs) are coupled to G-proteins Gi/Go family involved in the inhibition of neurotransmitter release [7, 44, 45]. In addition, recent evidence indicates that M4 mAChR is the major mAChR subtype responsible for direct cholinergic modulation of EPSP . Therefore, the pirenzepine effect on CCh-induced EPSP depression is probably due to an action of pirenzepine on M4 rather than M1 mAChRs . This view is supported by immunohistochemical data , showing that cortical M1 mAChRs are located exclusively at postsynaptic sites. 3) The effects of atropine and AFDX on the M2 mAChR-mediated increase of PPR were identical regardless of the sequence of application. However, the effects of pirenzepine and AFDX on the CCh-induced decrease of EPSP were different whether this antagonist is applied in the presence or before the CCh application. This difference may suggest that the CCh-induced decrease of EPSPmax and increase of PPR are mediated by two distinct mAChRs, i.e. the CCh-induced decrease of EPSPmax is not mediated by M2 mAChR. Moreover, the increase of PPR by CCh (mediated by M2 mAChR) was not prevented or reversed by pirenzepine. This suggests that pirenzepine is not active at M2 mAChR in our conditions. 4) AFDX applied before CCh or pirenzepine applied in the presence of CCh can both fully prevent and reverse, respectively, the CCh-induced depression of EPSPmax. The similar potency of pirenzepine and AFDX on CCh-induced EPSPmax depression therefore suggests an involvement of M4 mAChR as the most parsimonious explanation. Ample evidence suggests that mAChR-mediated signalling in the cortex is critical for learning and memory, yet the mechanisms of ACh facilitating cognitive processes remained elusive. The effects reported here, namely the depression of EPSP and the increased neuronal firing mediated by different mAChRs would provide a very interesting system for “attention” at the cellular level. The M4 mAChR-mediated depression of EPSP reduces the noise of ongoing synaptic activity while the M1 mAChR-mediated increase of neuronal firing augments the neuronal response to a given synaptic input, i.e. these two effects would improve the signal to noise ratio. 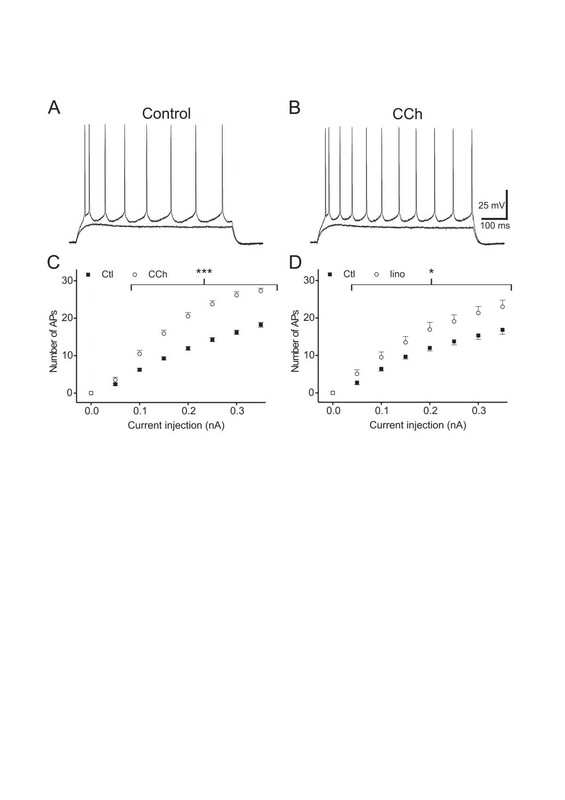 Moreover, the shallower input–output curve of synaptic responses induced by M4 mAChR observed here extends the subthreshold range for temporal summation, which is augmented by a CCh-induced reduction of Kir-type potassium current . In addition, the cholinergic depression of GABA release corresponds to a depression of inhibition by higher frequencies of stimulation  implicated in long-term potentiation . Together, these data corroborate and extend a theoretical framework proposed by Hasselmo and McGaughy . Our data provide evidence that the triade of cellular CCh effects are mediated by three subtypes of mAChR, i) M1 mAChR-mediated increase of firing, ii) M2 mAChR-mediated depression of GABA release and iii) M4 mAChR-mediated depression of glutamatergic synaptic responses. Activation of these effects by physiologically released ACh provides an interesting combination of neuronal attention and facilitation of LTP. In addition, the three parameters delineated here may present useful tools to test new M1, M2 or M4 mAChRs modulators at native receptors in the human neocortex from epilepsy surgery tissues. Coronal slices containing the sensorimotor cortex were made from male Wistar rats (age: 30-42 d). Experiments were approved by the Berlin health protection agency (T 026/96). Rats were deeply anesthetized with ether, decapitated and a block of brain containing the sensorimotor cortex was quickly removed. The tissue was cut into slices (400 μm) with a vibratome (HM 650 V, MICROM International, Walldorf, Germany) in artificial cerebrospinal fluid (ACSF, 5 ± 1°C). The slices were stored submerged at room temperature in continuously oxygenated (carbogen: 95% O2-5% CO2) ACSF. Slices were allowed to recover for at least 1 hour before recordings commenced. Individual slices were transferred to the recording chambers and given 30 min to adapt. ACSF contained (in mM) 124 NaCl, 5 KCl, 2 MgSO4, 2 CaCl2, 1.25 NaH2PO4, 26 NaHCO3 and 10 glucose (pH 7.4, after equilibration with carbogen). Atropine (Sigma, Taufkirchen, Germany), carbamylcholine-chloride (carbachol, CCh; Gift from GlaxoSmithKline), linopirdine dihydrochloride (Tocris, Bristol, UK) and pirenzepine (Sigma) were dissolved in H2O. AF-DX 116 (abbreviated AFDX, Tocris), retigabine and xanomeline (both gift from GlaxoSmithKline) were dissolved in DMSO. The final concentration of DMSO was below 0.1%. Stock solutions of each drug were prepared and stored at −20°C until use. The following mAChRs related compounds were used: pirenzepine (M1/M4 mAChRs antagonist), AFDX 116 (M2/M4 mAChRs antagonist), xanomeline (M1/M4 mAChRs agonist) and atropine (broad spectrum mAChRs antagonist) [24, 43, 49]. We refrained from using mamba toxin 7, a proposed selective blocker of M1 mAChR, because the application via perfusion would be prohibitively expensive and the stability under our recording conditions (oxygen, 32°C) is uncertain [communicated by a manufacturer]. We chose established concentrations of agonist and antagonist based on a literature survey and a few pilot experiments. A concentration of 10 μM CCh and 1 μM atropine is established in slices [21, 22], and at 1 μM, atropine does not interfere with nicotinic receptors . The concentrations of pirenzepine (1 μM) and AFDX (2 μM) were chosen from binding experiments [43, 49] and are effective on the CCh-induced depression of PSP in neocortex or hippocampus slices for example [22, 51]. Pirenzepine at 1 μM should have a maximal effect at M1 and M4 mAChRs but not at M2, M3 and M5 mAChRs. AFDX at 2 μM should have a maximal effect at M2 and M4 mAChRs but not at M1, M3 and M5 mAChR . From the above considerations, the following predictions can be made with a minimum of compounds: 1) a M1 mAChR-mediated effect should be antagonized by pirenzepine but not by AFDX, 2) a M2 mAChR-mediated effect should be antagonized by AFDX but not by pirenzepine and 3) a M4 mAChR-mediated effect should be antagonized by either pirenzepine or AFDX. To reveal more subtle pharmacological differences of the mAChRs, i.e. effects of activation state, we applied antagonists either before or during the CCh application. Experiments were carried out either in an interface-type recording chamber (ITRC) or in a submersion-type recording chamber (STRC). The ITRC enables maximal oxygen supply and improves recordings of evoked field potentials and was therefore chosen for the paired-pulse protocol. The STRC provides more stable conditions and allows a faster equilibration of drugs in the slices . Therefore, STRC was chosen for intracellular recordings. In ITRC, slices were perfused with oxygenated ACSF (1.5-2 ml/min; 34 ± 1°C) and the atmosphere was maintained by a continuous flow of pre-warmed and humidified carbogen. In STRC experiments slices were held between two nylon grids and perfused with a higher flow rate of oxygenated ACSF (4–5 ml/min; 31 ± 1°C). All measurements were made at least 30 min (ITRC) or 15 min (STRC) after drug application to ascertain steady-state of applied drugs. For extracellular recordings, filamented borosilicate capillaries (Hilgenberg, Malsfeld, Germany) were pulled on a DMZ universal puller (Zeitz, München, Germany). The pipette resistances were 2–8 MΩ when filled with ACSF. Sharp microelectrodes for intracellular recordings were pulled on a Flaming/Brown P87 Puller (Sutter Instruments, Novato, U.S.A.). When filled with 1 M potassium acetate (pH 7.2, containing also 1 mM KCl and 5 mM EGTA) the electrodes had resistances between 70 and 120 MΩ. The electrodes were positioned under visual control in neocortical layers II/III. Signals obtained with extracellular recordings were fed to a high-impedance preamplifier (EXT-01 C, npi electronic, Tamm, Germany) and processed through second-stage amplifiers with filtering capabilities (DPA 2 F; npi electronic, Tamm, Germany). The signals obtained with intracellular recordings were fed to an appropriate amplifier (SEC-05 L, npi electronic, Tamm, Germany). We evaluated the current voltage relationship from families of current injections (between −0.5 nA and +1.5 nA, increment 0.05 nA, duration 600 ms), to estimate the neuronal input resistance and the firing behaviour. Linear regression of the number of APs vs. injected current in the initial linear range was used to calculate the slope and the intercept. The former parameter provides a quantitative index of AP firing behaviour in a given condition. The latter represents the current just below the rheobase and was termed sub-rheobase. yielding the maximal EPSP amplitude (A2, EPSPmax), the half maximal stimulus (x0, I50) and the slope factor (dx). Synaptic conductance mediated by GABAA and GABAB receptors was estimated similar to previous methods [40, 52]. In brief, linear regressions of the current voltage relation (usually between −0.3 and +0.3 nA) was carried out before the stimulus and at the apparent peak of the early and late inhibitory synaptic responses (near 20 ms and 150 ms poststimulus). Assuming synaptic conductances parallel to “resting” membrane conductance, the subtraction of resting membrane conductance from the total conductance at the peak of GABAA and GABAB receptor-mediated events yields an estimate for the two synaptic responses see . To evaluate the effects of mAChR agonists/antagonists on neurotransmitter release supposedly via presynaptic sites, we recorded the field potentials during a paired-pulse protocol in an ITRC. The ratio of amplitude of the second field potential in relation to the first in response to identical stimulations (100 μs, 1 mA) was calculated for different interstimulus intervals (10 ms-1 s) and was termed paired-pulse ratio (PPR). An intensity of 1 mA was chosen for this protocol since it induced a maximal response with pronounced paired-pulse depression in all slices tested. In addition, we performed input–output curves, as in STRC. In ITRC, field potentials were elicited in cortical layers II/III by electrical stimuli (0-1 mA, increment 0.1 mA, 100 μs duration at 0.1 Hz, in triplicate) delivered via a bipolar tungsten electrode placed in cortical layers V/VI. Recorded signals were digitized on-line (10 kHz) with a PC based system (Digidata 1200 and Clampex 9.3 or Digidata 1440A and Clampex 10.1 software, Molecular Devices, Sunnyvale CA, USA), stored on hard disk and analysed off-line (Clampfit 10.1). Our intracellular recordings were from “regular firing” neurones, as opposed to “fast spiking” or “burst firing” neurones . Data are presented as mean ± s.e.m., n indicates the number of cells (only one cell per slice was recorded). For comparisons, we used paired or unpaired Student’s t-test. Differences with p < 0.05 were considered significant. We are most grateful to R. Fleischmann, who did some of the recordings with pirenzepine application. The study was made possible by a grant from G.S.K. S.G. and R.A.D. did the experiments, data analysis and writing of the manuscript. S.W. assisted during the experiments and provided helpful comments on the manuscript. G.A.J. C.H.D. and J.M.W. initiated these experiments and commented on a preliminary version of the manuscript.